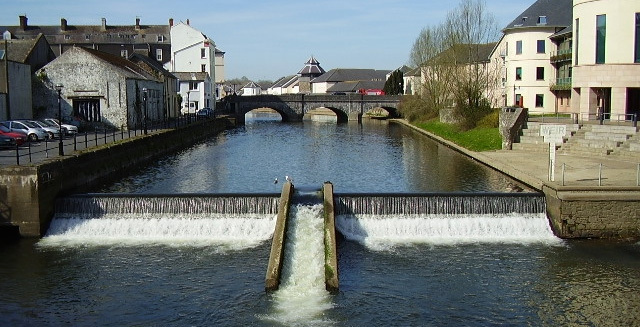 Haverfordwest, the county town of Pembrokeshire, is an picturesque little market town built on a hill overlooking the River Cleddau, which is dominated by the ruins of a 12th-c Norman castle. The river runs through the center of town, with wide variety of pubs, shops and restaurants spread out on either side. Several well positioned bridges allow shoppers to zigzag across the river to explore the town's narrow streets. These include two fine old stone bridges: 'Old Bridge' built in 1726, which spanned the original ford used by the invading Henry Tudor in 1485, and 'New Bridge' built in 1836 by architect William Owen. In addition to the usual commercial stores like Boots, Tesco and New Look, there are many smaller independent outlets selling more unusual and distinctive goods. An award winning Farmer's Market is also held once a fortnight on Fridays, selling locally caught fish, meat and fresh vegetables. There are plenty of independent hotels, B&Bs and guest houses in the town, plus several B&Bs and self catering cottages in the nearby villages, making Haverfordwest an ideal base from which to explore the delights of Pembrokeshire. There are also number of campsites in the locality. Other interesting sights in the town include the 18th-c Foley House in Goat Street, and the Gorsedd Circle located on the riverside near the A487 bridge. This stone circle, used for the National Eisteddfod ceremony in 1972, marks the start of a lovely riverside walk, where salmon and otters can often be seen swimming in the river. Erected by the Norman invader, Gilbert de Clare (1st Earl of Pembroke) in 1120. It forms part of a succession of forts built across Pembrokeshire to control the Welsh in the north. During the Civil War, Cromwell ordered the castle to be destroyed but much of it still remains intact. Part of the old keep now houses a museum and art gallery, which is open to the public. The forlorn ruins of the Augustinian Priory of St Mary and St Thomas are located in a riverside meadow, a short walk south of the town centre. Founded in 1200, the priory was later destroyed during the Dissolution of the Monasteries in 1536. Parts of the church, chapter house and cloisters are still visible. The ruins are set amongst a restored medieval garden discovered during excavations at the site. Location: Union Hill (end of Quay Street). Carmarthenshire: Ammanford, Carmarthen, Kidwelly, Llandovery, Llanelli, St. Clears. 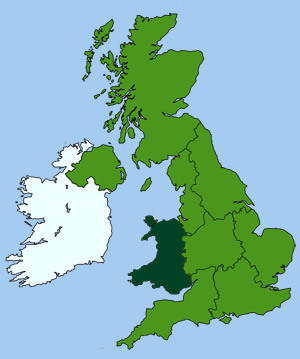 Pembrokeshire: Haverfordwest, Fishguard, Milford Haven, Pembroke, St. David's, Tenby.